Mark Cassutt, Univ. of Minn.
Astronomers have found an enormous hole in the Universe, nearly a billion light-years across, empty of both normal matter such as stars, galaxies, and gas, and the mysterious, unseen “dark matter.” While earlier studies have shown holes, or voids, in the large-scale structure of the Universe, this new discovery dwarfs them all. “Not only has no one ever found a void this big, but we never even expected to find one this size,” said Lawrence Rudnick of the University of Minnesota. Rudnick, along with Shea Brown and Liliya R. Williams, also of the University of Minnesota, reported their findings in a paper accepted for publication in the Astrophysical Journal. Astronomers have known for years that, on large scales, the Universe has voids largely empty of matter. However, most of these voids are much smaller than the one found by Rudnick and his colleagues. In addition, the number of discovered voids decreases as the size increases. “What we’ve found is not normal, based on either observational studies or on computer simulations of the large-scale evolution of the Universe,” Williams said. The astronomers drew their conclusion by studying data from the NRAO VLA Sky Survey (NVSS), a project that imaged the entire sky visible to the Very Large Array (VLA) radio telescope, part of the National Science Foundation’s National Radio Astronomy Observatory (NRAO). Their careful study of the NVSS data showed a remarkable drop in the number of galaxies in a region of sky in the constellation Eridanus. “We already knew there was something different about this spot in the sky,” Rudnick said. The region had been dubbed the “WMAP Cold Spot,” because it stood out in a map of the Cosmic Microwave Background (CMB) radiation made by the Wilkinson Microwave Anisotopy Probe (WMAP) satellite, launched by NASA in 2001. The CMB, faint radio waves that are the remnant radiation from the Big Bang, is the earliest “baby picture” available of the Universe. Irregularities in the CMB show structures that existed only a few hundred thousand years after the Big Bang. The WMAP satellite measured temperature differences in the CMB that are only millionths of a degree. The cold region in Eridanus was discovered in 2004. Astronomers wondered if the cold spot was intrinsic to the CMB, and thus indicated some structure in the very early Universe, or whether it could be caused by something more nearby through which the CMB had to pass on its way to Earth. Finding the dearth of galaxies in that region by studying NVSS data resolved that question. 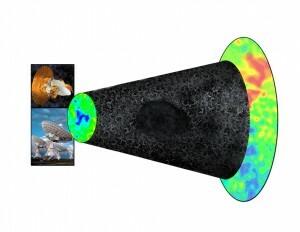 “Although our surprising results need independent confirmation, the slightly colder temperature of the CMB in this region appears to be caused by a huge hole devoid of nearly all matter roughly 6-10 billion light-years from Earth,” Rudnick said. How does a lack of matter cause a cooler temperature in the Big Bang’s remnant radiation as seen from Earth? Photons of the CMB gain a small amount of energy when they pass through a region of space populated by matter. This effect is caused by the enigmatic “dark energy” that is accelerating the expansion of the Universe. This gain in photon energy makes the CMB appear slightly warmer in that direction. When the photons pass through an empty void, they lose a small amount of energy from this effect, and so the CMB radiation passing through such a region appears cooler. The acceleration of the Universe’s expansion, and thus dark energy, were discovered less than a decade ago. The physical properties of dark energy are unknown, though it is by far the most abundant form of energy in the Universe today. Learning its nature is one of the most fundamental current problems in astrophysics. The NVSS imaged the roughly 82 percent of the sky visible from the New Mexico site of the VLA. The survey consists of 217,446 individual observations that consumed 2,940 hours of telescope time between 1993 and 1997. A set of 2,326 images was produced from the data, and these images are available via the NRAO Web site. The survey also produced a catalog of more than 1.8 million individual objects identifiable in the images. The NVSS has been cited in more than 1,200 scientific papers. NASA’s WMAP satellite, using microwave amplifiers produced by NRAO’s Central Development Laboratory, has yielded a wealth of new information about the age and history of the Universe, the emergence of the first stars, and the composition of the Universe. WMAP results have been extensively cited by scientists in a wide variety of astrophysical specialties. The National Radio Astronomy Observatory is a facility of the National Science Foundation, operated under cooperative agreement by Associated Universities, Inc. This research at the University of Minnesota is supported by individual investigator grants from the NSF and NASA. .